We’d love your help. Let us know what’s wrong with this preview of Dangerous Dough by Jessica Beck. 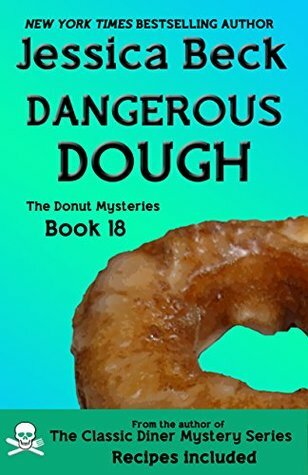 Donut Mystery #18, DANGEROUS DOUGH! Suzanne and Jake are finally married, but the honeymoon is over too soon when they find her mother waiting for them at the airport. Someone has murdered the new police chief in their absence, and the list of suspects comprise some of the folks closest to them, including Suzanne’s stepfather, her assistant at the donut shop, and several folks in the town Chief Tyler just left. As their investigation develops, suspicion falls on people from both sides of the law, and the newlyweds must learn to balance their new marriage with their drive to find the killers! To ask other readers questions about Dangerous Dough, please sign up. This is the eighteenth book in the donut shop mysteries. Suzanne has just arrived home from her honeymoon to find out that the new police chief had been posioned. Considering the cheifs personality, it is no suprise the suspect list is a long one, with Suzannes employees on it. Jake is appointed to led the investigation in April Sorings while Suzanne and Grace handle the investigation in the chiefs peevious town. After having a really hard time getting through the three previous books in this se This is the eighteenth book in the donut shop mysteries. Suzanne has just arrived home from her honeymoon to find out that the new police chief had been posioned. Considering the cheifs personality, it is no suprise the suspect list is a long one, with Suzannes employees on it. Jake is appointed to led the investigation in April Sorings while Suzanne and Grace handle the investigation in the chiefs peevious town. After having a really hard time getting through the three previous books in this seriesm I had my expectations set low. However, I really enjoyed the book. The pkot of the mystery was good and I was able to follow the clues aling with Suzanne and Grace. I won't wait to kong to read the next one. I liked this book, but for me, there was something lacking in the story. I gave it three stars because I liked it enough, I finished it. Will still try other books from this author. I really enjoyed this book! She really tries hard, and succeeds, in not doing any love scenes. If you don't want any or don't care if it's there or not, this is a good series for that. I don't like how the series is heading, though. If a state police officer were to retire, I believe he/she would be okay with some type of PI work. But I don't think any former cop would do half the things he does here. 18 of 39? And it was disappointing, it drifted too far in to fantasy - Yes these are fictional, but never would someone like Jake let the ladies tag along, & the chase at the end just careened into nonsense. If this much make-believe is allowed to create this story, one might as well read fairy tales. I love this series, but like I have said in numerous other reviews, the author's writing style really gets on my nerves. This time, it was over the top annoying. Yes, we know Jake is Suzanne's new husband, there is no reason she has to constantly refer to him that way. That being said, this mystery was pretty good. I totally thought it was someone else and was surprised at the ending. I am never disappointed by Jessica s books!! The characters are so much fun and I love how Suzanne and Grace always manage to get information out of the suspects that the police can't always get. The story of Suzanne, owner of Donut Hearts, continues with her and Jake returning from their honeymoon in Paris and landing right in a murder investigation of he new chief in town. This may be their last adventure. A cute short mystery. Nice for a lazy day at home. Hope this is not the last book- The ending has me kinda worried! Great book. I'm not a person that reads a book in one or two sittings but this just kept me riveted. It was a fun mystery book. This is yet another great book in this series. I would think that by book 18 the characters and stories would start getting stale but that is just not the case. They just keep getting better. Pretty good storyline and I also found it interesting seeing the dynamic change a bit with Grace and Suzanne, now that Suzanne and Jake are married and him helping with their investigation.